There shall be twelve issues, four volumes per year (January, February, March, April, May, June, July, August, September, October, November, December). Manuscript should be submitted to the Administrative Editor, B-2 (Ground Floor), South City II, Gurgaon 122 018, Haryana, India via e-mail to: kre@airtelmail.in. Materials submitted for publication are to be prepared in accordance with The Guide for Contributors, which is published January issue of the journal (or visit our website: www.krepublishers.com). Manuscripts which do not fully confirm to Journal style will be returned to the Authors. All papers and articles submitted are subjected to review. The possible exceptions are in the case of occasional invited papers and editorials, or where a partial or entire volume is devoted to a special theme. The annual subscription price for twelve issues, four volumes per year for institution, libraries and other corporate bodies is US$ 600/- Rs. 18000/- (Single Issue: US $ 55/- Rs. 1750/-). Rupee prices are valid in India. Subscription rates include postage air mail delivery. : Forward change of address about two months prior to move. Claims for undelivered copies will be accepted only after the following issue is received. Missing copies will be supplied when issues have been sustained in transit and where reserve stock permits. Subscription cancellations will not be accepted after the first issue has been mailed. 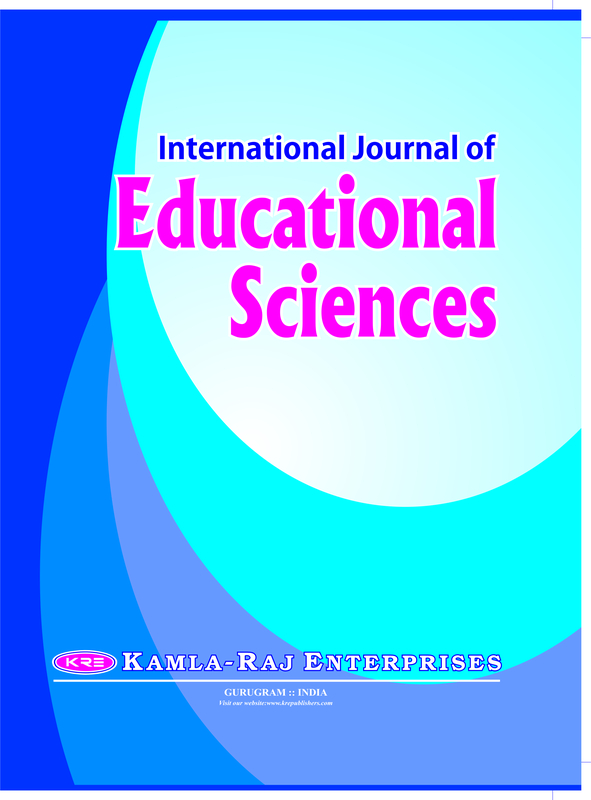 The International Journal of Educational Sciences (Int J Edu Sci) is designed for the prompt publications of original and important articles related to contemporary society. It contains original papers on current research and practical programmes, short notes, news items, book reviews, reports of meetings and professional announcements. 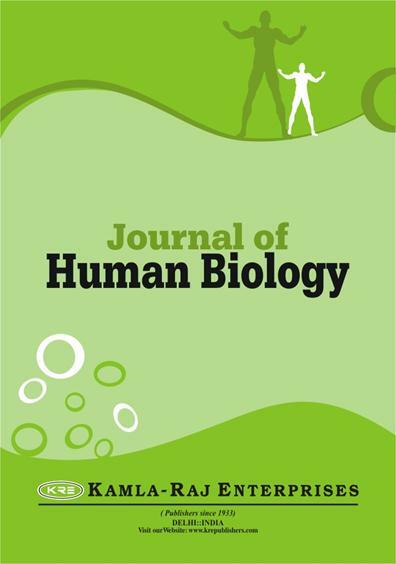 Constructive critiques and discussions of published papers and letters which are of relevance and of interest to the readership are published at the discretion of the Managing Editor. 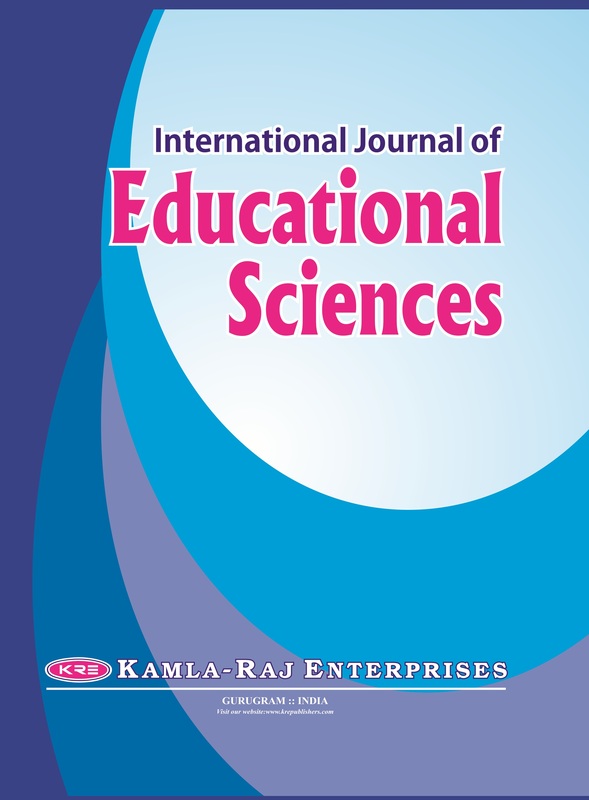 International Journal of Educational Sciences is published in English; spelling and usage conforms to the Oxford English Dictionary; for consistency and simplicity in style because for many subscribers English is a second language. Place names should be spelled in the form officially used in the country under discussion; where this differs from the commonly-known name of the English-language name, the other name should be written in parentheses. For practical purposes accents may be omitted on non-English names. There shall be twelve issues, four volumes per year. For the initial submission of manuscripts for consideration, submit it via e-mail to kre@airtelmail.in. Prepare the manuscript as per style of the Journal. Manuscripts, which do not fully confirm to Journal style, will be returned to the Authors. In the paper Author should not use any copyright material (Figure/Tables etc.). However he/she may write about that in the form of text in the paper. The contributors may provide the names of at least three Referees in the field of specialisation as the subject of the paper demands, to whom we may request for review of the paper (Please provide separate List of Referees for each paper) The Referees should be other than the Members of Editorial Board of the Journal, who are known to you and aware of the research activities of your Department/Institute, but are not from yours’ Department/Institute (Please provide their postal & e-mail address and field of specialisation). The possible exceptions are in the case of occasional invited papers and editorials, or where a partial or entire volume is devoted to a special theme. Pay the charges of the paper and for Black and White and Coloured Photographs, if any in the paper (Not for Line Drawings/Graphs in Black and White only), which is mandatory. Please check that the payment of Paper Charges is not a guarantee that the paper may be accepted as it is. After final acceptance, the final and exactly matching printed versions with the underlining clearly marked should be submitted via e-mail to kre@airtelmail.in. Acceptance of paper will be acknowledged via e-mail, than send the processing fee of the paper and the photograph, if any in the paper. Authors must accept full responsibility for the content of their articles. The Members of the Editorial Board and the Publisher of the journal are not responsible for the statements and opinions expressed by the authors in their articles/write-up published in the journal. While submitting the paper the author (s) must give a declaration that, “the article has not been published or sent for publication elsewhere”. 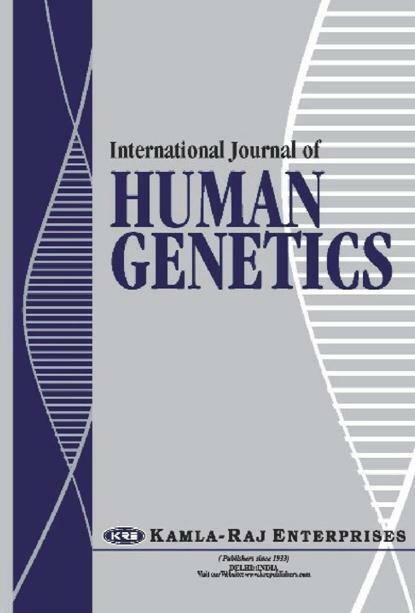 The paper title, author’s name, affiliation, complete address, Fax number, and e-mail address should appear on the first page of the article. When there is more than one author, the correspondence will be sent to the first author, unless otherwise requested. Not more than 40 characters (including spaces) should be identified on the title page. Not exceeding six should accompany the manuscript. Each table should be typed separately and marked in the text in numerical order. It should be clear, concise, and good for reproduction (maximum size for illustrations is 120 x 180 mm/80x160mm). All illustrations are referred to as Figures. Photograph should be sharp for reproduction (maximum size for photographs is 120 x 180mm/80x160 mm). A separate list of tables, figures, and illustrations with captions should accompany the manuscript. The metric system should conform to the International System of Units (S. I.).
. Delhi: Kamla-Raj Enterprises, pp. 173-187. August 29, 1982, P. 9.
in H.P. University, Shimla, November 13 to 16, 1978.
. MAB Report Series No. 14, Paris: Unesco. Ph. D. Thesis, Unpublished. Delhi: University of Delhi. Morgan, D 2000. Deregulation education in the United States: From Vouchers to Home Schooling to the end of Voluntary Deregulation. From <http://www.writ.news.finalw.com/commentary/20020917morgan.html> (Retrieved on 22 April 2004). The galley proofs will be sent to the corresponding author via e-mail for correction of typographical errors only; alterations other than correction of printer errors will be charged to the author. All corrections should be marked clearly, directly on page proofs. These may be ordered at prices shown on the order blank accompanying proofs. No free reprints are supplied, but any number in excess of 100, with or without covers, may be purchased. The order, along with payment, for reprints and extra printed pages (if paper exceeds twelve printed pages) should be sent to the Administrative Editor.